1.6 Billion Bullets and Department of Education buying weapons.... RE-DACTED! On Tuesday, October 11, 2011, HSPI hosted the Hon. Janet Napolitano, Secretary of Homeland Security, the Hon. Tom Ridge, former Secretary of Homeland Security, and the Hon. Michael Chertoff, former Secretary of Homeland Security in a conversation moderated by former Coast Guard Commandant Admiral Thad Allen. In 1994, despite being little-known outside of northwest Pennsylvania, Ridge ran for Governor. He won the election as a pro-choice Republican. He was reelected in 1998 with 57 percent of the vote in a four-way race. His share of the vote in that election was the highest for a Republican governor in Pennsylvania (where Democrats outnumber Republicans by almost 500,000) in more than half a century. Ridge served as Governor until his resignation to become the Director of Homeland Security in 2001. Following the September 11, 2001, terrorist attacks, U.S. President George W. Bush created the Office of Homeland Security within the White House, and named Ridge to head it. So what's Leiberman going to be up to NOW and what did he help create (2 billlion rounds of ammo)? 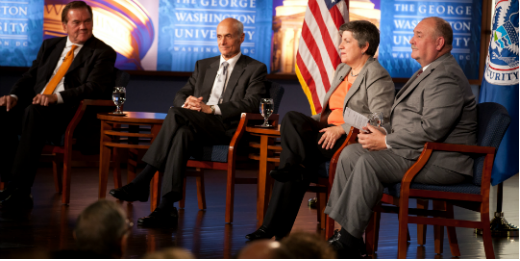 (L-R) Homeland Security Secretary Janet Napolitano, Senate Homeland Security and Governmental Affairs Committee Chairman Sen. Joseph Leiberman (I-CT) and former DHS Secretary Michael Chertoff participate in a ceremony honoring Leiberman at the U.S. Citizenship and Immigration Services December 19, 2012 in Washington, DC. Lieberman, who is retiring after 24 years in the U.S. Senate, was recognized by Napolitano for his "advocacy and leadership on behalf of the Department of Homeland Security and the country and for helping to ensure the safety and security of the American people." 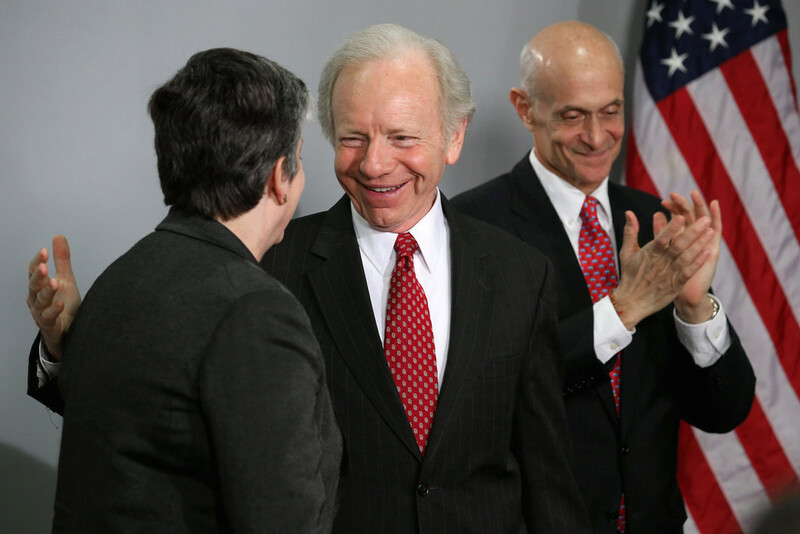 Former Sen. Joe Lieberman (I-Conn.) is slated to return to Capitol Hill next week to testify before the House Homeland Security Committee in Congress's first hearing on the Boston bombings. Committee Chairman Mike McCaul (R-Texas) said the hearing is the first in a series that will look at the immediate aftermath of the attack, which killed three people and wounded more than 200, and whether key signs were missed by federal, state, or local law enforcement and intelligence gathering officials. 2.2 billion rounds now. They keep lying to congress & only stating what is being purchased at the time. My best friends are Jews (no, really), I have a Jewish name, and my Boss is a Jewish rabbi ... I have nothing against "you people" but I think people's tribal self-proclaimed religious or tribal background is always a factor in their decisions and needs to be duly noted. that goes for members of my tribe as well. I am one of the loudest critics of black people, and black misleaders, you will ever meet. People hide all kinds of nefarious things under cover of tribal identity, religion, and victimhood. Oh, I agree with that. I sometimes HATE Israel for getting the rest of us American Jews in trouble and then expecting us to rubber-stamp ANOTHER atrocity. I hate the way so many American Jews seem to believe Israel is just like America. Israelis have NO rights! They can "disappear" for MONTHS and their families have no right to even QUESTION why. Why would any American Jew want to go THERE? Because we've been brainwashed, of course. There are times, unfortunately, when certain criticisms just seem to hit a nerve, and I apologize for my outburst, but the degree of Israel hatred I often see online makes me wonder if "Israel" and "Zionism" might sometimes be used as "codewords" for hatred of Jews by those who have their own agenda. Sorry, I guess Jews just have thin skins. Recent segment of Alex talking about the ammo shortage. Re: 1.6 Billion Bullets and Department of Education buying weapons.... RE-DACTED! You see this is the kind of gun control they like. Heavy duty full-auto AK's in foreign countries destabilizing government's unfriendly to US. U are not to have these weapons of freedom. They are reserve for AlCIADA rebels. Hey, Maybe all that ammo is going to Syria? 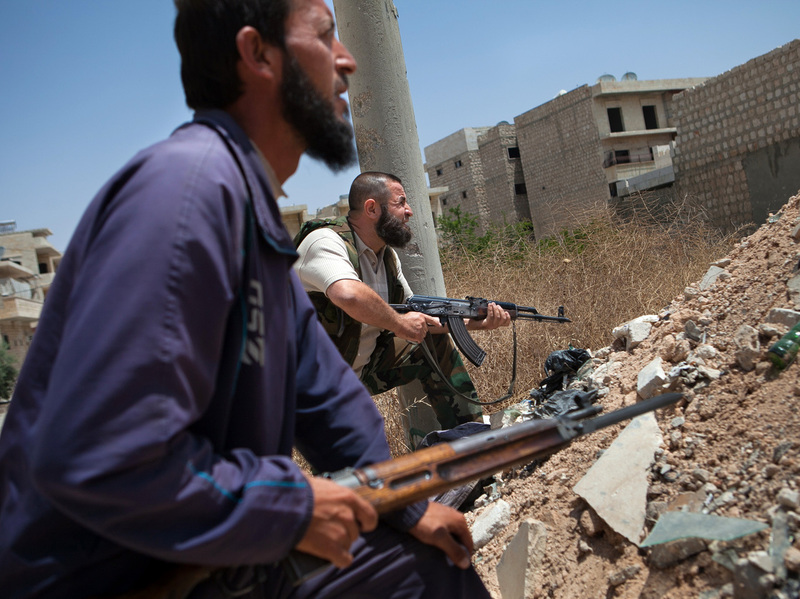 Syrian rebel fighters hold a position Thursday in the northwestern town of Maaret al-Numan. At least 93,000 people, including more than 6,500 children, have been killed in Syria's civil war. DHS "personal Defense" is a citizens "Assault Weapon"
While the Obama administration calls for a ban on assault rifles and high-capacity magazines, the Department of Homeland Security is seeking to acquire 7,000 â€œpersonal defense weaponsâ€� â€” also known as â€œassault weaponsâ€� when owned by civilians. Critics, such as Republican New York state Sen. Greg Ball, are already blasting the DHS request, arguing that the government deems these firearms as suitable for self-defense but want to ban civilians from owning them. In yet another huge blow to the rhetoric and narrative of the Obama administration and its desire to disarm the American public, a DHS bid has been uncovered (see documents below) showing that the Department of Homeland Security recently put out an offer to purchase 7,000 full-auto â€œassault weaponsâ€� to be used domestically, inside the USA. But it seems he really means they donâ€™t belong on the streets of our cities unless they are in the hands of homeland security enforcers, in which case they can be FULL-AUTO assault weapons. The juiciest part of this bid is the use of the phrase â€œPersonal Defense Weaponsâ€� to describe the full-auto AR-15s being purchased by DHS. The U.S. Postal Service is currently seeking companies that can provide â€œassorted small arms ammunitionâ€� in the near future. On Jan. 31, the USPS Supplies and Services Purchasing Office posted a notice on the Federal Business Opportunities website asking contractors to register with USPS as potential ammunition suppliers for a variety of cartridges. â€œThe United States Postal Service intends to solicit proposals for assorted small arms ammunition,â€� the notice reads, which also mentioned a deadline of Feb. 10. The Post Office published the notice just two days after Sen. Rand Paul (R-Ky.) announced his proposal to remove a federal gun ban that prevents lawful concealed carry holders from carrying handguns inside post offices across the country. Ironically the Postal Service isnâ€™t the first non-law enforcement agency seeking firearms and ammunition. Since 2001, the U.S. Dept. of Education has been building a massive arsenal through purchases orchestrated by the Bureau of Alcohol, Tobacco and Firearms. The Education Dept. has spent over $80,000 so far on Glock pistols and over $17,000 on Remington shotguns. The Department of Homeland Security is buying more bullets with a solicitation for over 141,00 rounds of sniper ammunition. According to a solicitation posted on FedBizOpps, the federal agency is looking to procure 141,160 rounds of Hornady .308 Winchester 168gr A-MAX TAP ammunition. Such ammunition is sometimes retailed as â€œZombie Max,â€� a marketing gimmick alluding to its power. The latest purchase further illustrates the fallacy of the DHSâ€™ excuse that it is buying bullets in bulk in order to save money. The Department of Homeland Security plans to purchase 75.1 million rounds of ammunition at a cost of $22.7 million this year, according to a newly released report from the Government Accountability Office. GAO reports that DHS has over 70,000 firearm-carrying personnel and that the ammo purchases go largely to firearm training and qualification requirements. According to the GAO, DHSâ€™ annual ammunition purchases have been on the decline since FY 2009 and are about at the same level as the Department of Justiceâ€™s ammo purchases. In 2013, DHS purchases 84.4 million rounds of ammo at a cost of $19.9 million; in 2012 it bought 96 rounds at a cost of $30.3 million; 2011 it bought 100.3 million for $30.2; in 2010 it purchased 117 million for $31.6 million; and in 2009 the department bought 132.9 rounds for $33.8 million. GAO notes that the department is planning to buy 75.1 million rounds for $22.7 million this year. The U.S. Army has built a 300 acre â€˜fake cityâ€™ complete with a sports stadium, bank, school, and an underground subway in order to train for unspecified future combat scenarios. The recently opened site is located in Virginia and was built at a cost of $96 million dollars, taking just two years to complete. While the city was ostensibly built to prepare U.S. troops for the occupation of cities abroad, some will undoubtedly fear that the real intention could be closer to home. Although the site includes a mosque, the town looks American in every other way, with signs in English. The US army has built a fake city designed to be used during combat training exercises. The 300 acre 'town' includes a five story embassy, a bank, a school, an underground subway and train station, a mosque, a football stadium, and a helicopter landing zone. There are also bridges and several other structures which can be transformed into different scenarios. The US Government is running 7/7 Drills over the last weekend to kick off several other false flag scenarios including cyber warfare games on 2/16/2010. Metro says the show-of-force exercise is meant to remind riders that the agency remains vigilant against terrorism. Metro plans to conduct similar drills in the future with other law enforcement agencies. This is a combined synopsis/solicitation for commercial items prepared in accordance with the format in FAR Subpart 12.6, as supplemented with additional information included in this notice.The solicitation number is HSTS02-14-Q-NCP056 and is issued as an invitation for bids (IFB), unless otherwise indicated herein.The solicitation document and incorporated provisions and clauses are those in effect through Federal Acquisition Circular FAC 2005-72. The associated North American Industrial Classification System (NAICS) code for this procurement is 325920 with a small business size standard of 750.00 employees.This requirement is a [ Small Business ] set-aside and only qualified offerors may submit bids.The solicitation pricing on www.FedBid.com will start on the date this solicitation is posted and will end on 2014-03-13 16:00:00.0 Eastern Time or as otherwise displayed at www.FedBid.com.FOB Destination shall be in the Statement of Work. In the event this procurement is a total small business set-aside, the following shall apply: For small business set-asides other than for construction or services, any concern proposing to furnish a product that it did not itself manufacture must furnish the product of a small business manufacturer unless the SBA has granted either a waiver or exception to the nonmanufacturer rule. In industries where the SBA finds that there are no small business manufacturers, it may issue a waiver to the nonmanufacturer rule. In addition, SBA has excepted procurements processed under simplified acquisition procedures, where the anticipated cost of the procurement will not exceed $25,000, from the nonmanufacturer rule. Waivers permit small businesses to provide any firm's product. Please see FAR 19.502-2 for more information and exceptions. For this procurement, the associated North American Industrial Classification System (NAICS) code is__________with a small business size standard of_________ employees / average annual receipts." At the time of bid closure, contractor must have an "ACTIVE" record with no exclusions. Whow - now what's that for??? UNIMAX is an extra gelatin dynamite formulated to consistently deliver high detonation velocity and excellent water resistance and designed to satisfy the vast majority of explosive applications in hard rock. Put this in the â€œWhat in the hell are they thinking?â€� category, but the Department of Homeland Securityâ€™s (DHS) protectors of the friendly skies, the Transportation Safety Administration (TSA) has submitted another request for high explosives via the Federal Business Online website today, and has issued a Limited Source Justification for three businesses to provide the material: Hallowell Manufacturing LLC, Omni Explosives Inc, and Tripwire Operations Group. By the manufacturerâ€™s own description, this explosive is best suited for mining use, not airline safety. The question then remains: Why would the TSA purchase dynamite? Before that, it was the Department of Agriculture requesting 320,000 rounds. More recently, the Department of Homeland Security raised eyebrows with its request for 450 million rounds â€” at about the same time the FBI separately sought 100 million hollow-point rounds. "NOAA â€” really? They have a need? One just doesn't know why they're doing this," he said. "The problem is, all these agencies have their own SWAT teams, their own police departments, which is crazy. In theory, it was supposed to be the U.S. marshals that was the armed branch for the federal government." For instance, regular Internal Revenue Service agents aren't equipped with on-the-job guns â€” but those affiliated with the agency's Criminal Investigations Division are. The Department of Homeland Security employs in its various law enforcement entities â€” from the Coast Guard to the Secret Service to Customs and Border Protection â€” more than 200,000 workers, an estimated 135,000 of whom are authorized to carry weapons. When the agency makes its ammo buys, it often does so over the course of several years. The Obama administration's stated desire to scale back gun rights drove more in the private sector to purchase firearms â€” which in turn fueled ammunition sales, McGuigan said. But the notion of the Obama administration's using backdoor means to scale back gun ownership â€” a move that's hardly been kept secret â€” doesn't seem that outlandish to some. "I don't believe in conspiracy theories, but it doesn't make a whole lot of sense," Gottlieb said. "The amount of ammunition they're buying up far exceeds their needs. It far exceeds what they'll use â€” they'll never use it all." A May 7th solicitation by the U.S. Department of Agriculture seeks "the commercial acquisition of submachine guns [in] .40 Cal. S&W." the story that keeps on giving ,,, when will the govt. start distributing these rifles and ammo to tax paying citizens? When we take them from their cold, dead hands. All the elements are in place to spark a civil conflict. For citizens, the firearms industry control is at an all time high. Prices have gone up. Quality has gone down. Ammo availability has gone down. All because of â€œpublic/private partnershipsâ€� or, in other words, a fascist govcorp. Yet, there have been record sales every time thereâ€™s a rumor of registration and mass confiscation. The Bloomberg/drill-presented-as-real events have failed to persuade the public majority to disarm. BUT, consider that that program was and is intended to have the exact opposite effect. Injustice is at an all time high. If a uniform breaks and enters into your home at 0400 and you defend yourself from an unknown assailant, then you go to jail for murder. If a uniform decides to shoot you or any of your family members on a whim, then he/she goes home to a steak dinner and a 6-month paid vacation. And now we see orders for newly-manufactured, NAZI style full auto submachine guns. No explanation will be forthcoming. Meanwhile, law-abiding citizens have so many restrictions placed on them that semi-auto weapons are the best they can manage to own. The small arms buildup in the US has been carefully managed for years now, along with the wedge of distrust between government employees and private citizens. â€œUs vs themâ€� has been forged into the public consciousness. A majority in both the Senate and House â€” 52 senators, 238 House members â€” have joined to oppose the Obama administration's move to ban a popular type of ammo used in the top-selling AR-15 rifle and pistol because it pierces police body armor. A week after the House members, led by Judiciary Committee Chairman Rep. Bob Goodlatte, sent a letter of opposition to the Bureau of Alcohol, Tobacco, Firearms and Explosives, Senate Judiciary Committee Chairman Sen. Chuck Grassley echoed that in his own letter signed by 51 others. In their letter, the senators said that the 5.56 M855 "green tip" cartridge was exempted in a 1986 law, along with other rifle ammo from bans on armor-piercing rounds. The reason: popular rifle ammo is not used in shootouts with police. The â€˜green tipâ€™ or solid steel tip 5.56/.223 is a cleaner shotâ€¦it penetrates going right through where as the traditional lead 5.56/.223 when it hit flesh flattens out, tumbles and fragments therefore violating the Geneva Convention. So our military switched to something less than â€˜inhumaneâ€™ (whatever, like a bullet is somehow different in its effect). Now here is the kickerâ€¦we now have available â€˜pistolsâ€™ that take and fire the 5.56/.223, 7.62 x 39, and 7.62 x 54r. When the regulations were put into place in the late 80â€™s and early 90â€™s we had no such firearms. We do NOW. There are in fact AR 15 pistols, AK 47 pistols and yes Virginia, some DA came up with a Mosin pistol. Under ATF rules exemptions were given to steel core or steel tip ammunition because they were for rifles ONLY!!! Within the past few years, pistols that would take the 5.56/.223, 7.62 x 39 and 7.62 x 54r have become commercially available thus giving the ATF a way to regulate these rounds given that the EXEMPTIONS for these rounds were given in years past ONLY because they were RIFLE rounds. Yes, what they, the ATF is trying to do is bullcrap, none of the bullets they are trying to ban are â€˜armorâ€™ piercing, except for the fact the average LEO wears no more protection outside of â€˜stabâ€™ (very few wear what is known as SAPI plates which stop small arms or military grade). But what we have going on here is nothing less than back door UN Small Arms Treaty via backdoor. This is NOT about a bullet! This is about the UN SMALL ARMS TREATY that the US did not ratify but because of Obama and his elk who absolutely believes in relieving us of our second amendment rights, will do anything to make it real. First comes the ban on â€˜green tipsâ€™ and other types of bullets which are primarily import surplus, next comes denying our right to certain types of firearms. I am not a fear monger, but the ATF is in the process of taking away our rightsâ€¦first they come for steel tip and others, next they will come for the firearmsâ€¦let them know you wonâ€™t stand for this. Say it loud and stand proud. Now, a new Homeland Security purchase order listed on FedBizOpps also raises an eyebrow or two, given the heated and divided political and social climate at hand. Just look at what happened in Ferguson. On top of a wide range of gas and chemical grenades, rubber bullets and other riot rounds, the purchase calls for â€œcontrolled noise and light distraction devices,â€� including flash bangs which set off a 175 dB sound with 6 â€“ 8 million candelas light bursts in 10 milliseconds. Of course the guess would be BIG CITY CHAOS. The Department of Homeland Security is set to purchase over 62 million rounds of ammo typically used in AR-15 semi-automatic rifles, just weeks after the ATF was forced to back down on a ban on M855 bullets. A posting on FedBizOpps.gov this week reveals that the DHS is looking to contract with a company to provide 12.6 million rounds of .223 Remington ammunition per year for a period of five years â€“ totaling 62.5 million bullets. The solicitation explains that the purchase is intended, â€œto achieve price savings over the current .223 Rem duty ammunition.â€� The bullets will be used by U.S. Customs and Border Protection agents nationwide for â€œtrainingâ€� purposes. 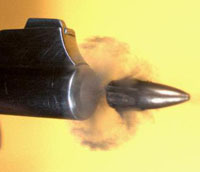 The .223 Remington is one of the most common rifle cartridges in use in the United States and is used both in bolt action rifles and semi-automatic rifles such as the AR-15 and the Ruger Mini-14. â€œIf they periodically do this in increments, theyâ€™re going to control how much ammo is available on the commercial market,â€� a weapons manufacturer told Michael Savage, adding that the contracts with bullet manufacturers stipulate that everything made goes to the government as the number one priority before it is allowed to enter the commercial market. â€œThe extraordinary level of ammunition purchases made by Homeland Security seems to have, in states such as my own, created an extreme shortage of ammunition to the point where many gun owners are unable to purchase any,â€� LaMalfa wrote in the letter. The bulk purchase follows attempts by the Bureau of Alcohol, Tobacco and Firearms to ban M855 ammo, another popular round for AR-15â€™s used by hunters. The ATF justified the ban by claiming that the bullets were â€œarmor piercingâ€� and a threat to law enforcement officers. After being on the receiving end of a huge backlash, the feds were forced to back down and ATF director B. Todd Jones subsequently tendered his resignation. Democratic Congressman Steve Israel called the ATF backdown â€œcowardlyâ€� and vowed to revive the ban. The ATFâ€™s threat to ban the ammo temporarily caused prices of the bullet to surge more than double in price. Thatâ€™s enough ammo to kill around 30% of the worldâ€™s population. Furthermore, U.S. soldiers were shooting around 5.5 million rounds of ammunition per month during the war in Iraq, or 66 million rounds annually. Using that figure, the feds have stockpiled enough ammo over the past two years to fight a 32-year war. Kit Daniels also contributed to the bottom of this article with an update. Yes, they can purchase all this ammo with money we don't have---fiat money. I'm not worried about federal employees. Most of them can't do their jobs right. Do you think they can shoot straight? Do you think one of those fat TSA workers can actually shoot a gun? WHY THE F*CK DON'T THE AMMO MANUFACTURES BAN THE GOVERNMENT FROM BEING ABLE TO BUY AMMO, REALIZING THAT THEY'RE THE ENEMY AND EVENTUALLY THEY'D KILL THE AMMO MANUFACTURERS THEMSELVES? There should have been a ten million man march against DHS along time ago and the executives who run it drug out onto the streets and senselessly beaten to a bloody pulp and put in wheelchairs for life, and the controlled demo DHS's billion dollar headquarters and all of their offices in existence? Real patriots like Andrew Jackson would have taken the entire Rothschild family, Rockefeller, and and them hung or beheaded for treason. It's so pathetic that people aren't going to actually defend their country until these arch-criminals have fully prepped and armed themselves 100 times more than they would need against 320+ million "slaves". What's next? We'll see a report that says they've armed domestic drones with small tactical nukes of several kilotons each. If these manufacturers are selling them ammo then that by default means that they are owned by TPTB themselves, and could give a damn about middle class Americans being armed. of shotgun shells and also the high explosive material DHS bought. the other sheeple dopamine people drown themselves in. TSA, DHS Order 1,400 Pounds of High Powered Explosives Set to Deliver August 31Documents reveal that The Department of Homeland Security (DHS) has ordered over 1,400 pounds of super high-powered explosives through the (TSA) Transportation Safety Administration set to be delivered on August 31st. The news comes just after it was reported that the DHS had purchased over 1.2 billion rounds of hollow point bullets and a wide assortment of riot gear. The new explosives purchase, as highlighted by mainstream news service Government Security News, consists of 1,400 pounds worth of high density ammonium nitrate and A-5 Flake RDX explosives. According to an explosive materials manual, both of these items are considered â€˜high poweredâ€™ explosives. High density ammonium nitrate in particular is used in certain types of dynamite. The recent bulk acquisition of bullets, explosives, and war-ready protective gear has been written off by the mainstream media as nothing more than a bare necessity for training. Of course the amount of hollow point bullets, which happen to be military-grade and in sufficient enough quantity to allocate 4 bullets per American citizen, also happen to be several times the â€˜normalâ€™ amount of training-related orders put in by government agencies. The TSA will likely write this purchase off in a similar manner, however it is important to note that this is the same agency that has not only ignored research published as far back as 1998 highlighting the link between their x-ray machines and cancer, but has been caught telling children that sexually groping them is a â€˜gameâ€™. bordershotgunCustoms and Border Protection (CBP) intends to procure two million rounds per year of 12 Gauge slug shotgun â€œstandardâ€� ammunition for use by its agents and other DHS components, plus another two million rounds per year of the â€œreduced recoilâ€� version of the same ammunition. â€œThis ammunition will be provided to all Customs and Border Protection (CBP) and Immigration and Customs Enforcement (ICE) officers and agents and will be used throughout the continental United States, Alaska, Hawaii and other US Territories and possessions,â€� explains a presolicitation notice issued by CBP on September 18. CBP intends to issue a Request for Proposal (RFP) on or about October 31 for a full and open competition to win an indefinite delivery/indefinite quantity (IDIQ) contract, says the notice. companies and many arms manufacturers as well?? According to [BLM] Davis, funds for the ammunition are drawn from revenues generated by utility companies that buy electricity from Hoover Dam, rather than from tax dollars. Larson.......... Sound like the Ole Gov are prepers.